Recent research indicates that teachers value exemplary lesson plans additionally to modelling software materials such as SCYDynamics. For teachers interested in the use of SCYDynamics in the classroom context, take a look at this (Dutch) lesson plan, which provides an example of the use of SCYDynamics in biology education. To get familiar with SCYDynamics specifically, take a look at the (Dutch) SCYDynamics tutorial. Originally meant for students, but also very useful for teachers unfamiliar with this type of software. You can download the tutorial version of SCYDynamics here (start it with a double-click). The study had two purposes: to see whether students were capable of creating drawings that could help them identify relevant variables in the system and to see if and how the drawing depends on the mode of information offering. 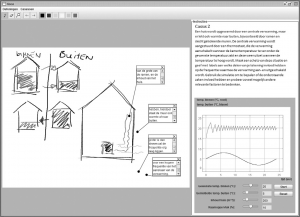 We also used the drawings to test whether we could in principle analyse them automatically, a feature that is now partly implemented in SimSketch. We found that (1) students can draw and use those drawings to represent relevant variables (2) that simulations can be a serious hinder in the creative process: students using simulations limit themselves to the variables they see represented. 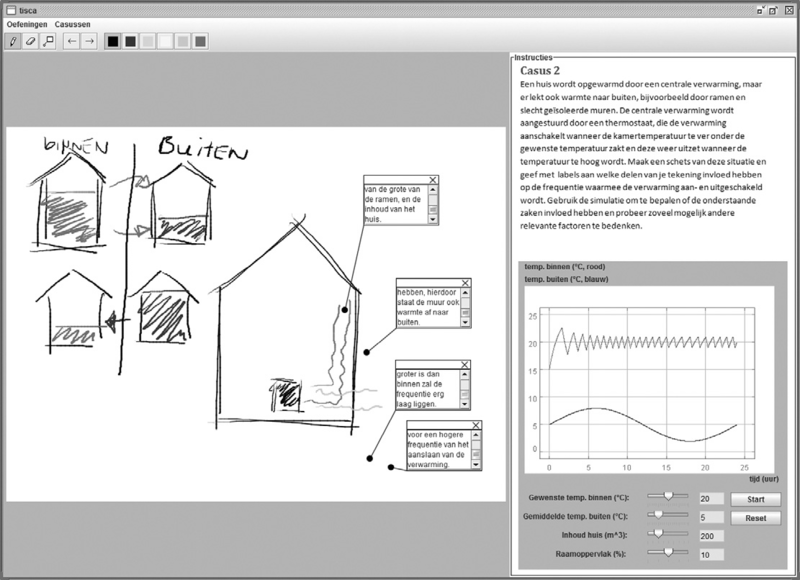 Students in the other group are more creative and (3) the properties of the drawings are such that we can analyse them – or at least easily divide them into separate drawn objects – which is what we now can do in SimSketch. This work really helped us to develop SimSketch. Frank luckily stayed with us and is now working on his PhD. The full paper can be found here. a new version of SimSkech is out! A small bug has been fixed (which caused a crash when you would assign both a “Distribute” and a “Factory” behavior to a unit), and you can now load SimSketch files by drag’n’dropping them from your favorite file explorer. Yesterday I gave a keynote at the EARLI SIG 20 conference. I presented the ideas that lead to the development of SimSketch as well as some initial empirical results. You can see the slides I used for this presentation below. The video on one of the slides is presented below the slides. I just uploaded a new version of SimSketch – the automatic grouping feature is back again! We are using now a completely new algorithm/library, which works fine with Java 7. It is nearly as accurate as the previous one (and I may do some fine-tuning in the next weeks), but it is much faster and brings SimSketch’s download size down to ~4MB (from originally ~9MB). some minutes ago, I uploaded a new version of SimSketch. What’s new? A reset button has been added in the simulation view, which makes your life easier when you want to re-run a model from start. A first version of a statistics display has been added (rightmost button in the simulation toolbar). Currently, it shows graphs for the number of objects and their average speed over time. More options will come soon! The “find groups” feature has been disabled temporarily, because a library we used is incompatible with Java 7. We will re-activate this feature soon with a new algorithm! You can start SimSketch as usual by clicking here or on the screenshot below. 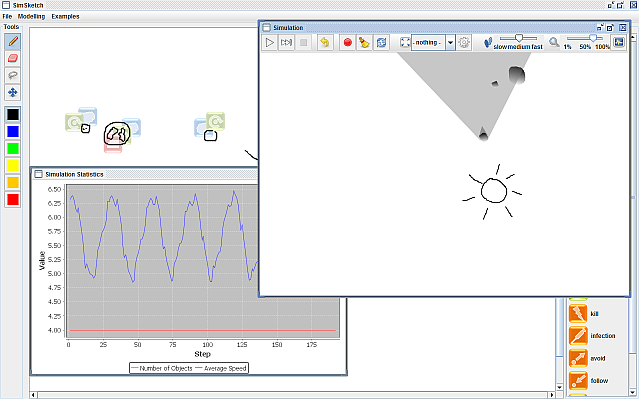 At the OCÉ Computer Science Summer Camp at the end of August, we will try to make SimSketch “kinectable”, i.e. make the user interface controllable with the Microsoft Kinect sensor. Interested students with a computer science background can still apply for participation! More details can be found in this presentation.